You may have heard Jamie Oliver's Food Revolution. It's on Friday's at 9pm on ABC and it's a reality show featuring British chef and nutrition advocate Jamie Oliver trying his hand at reforming American eating. Food Revolution certainly fits the mold of the reality TV genre, replete with type casting of villains, rubes and heroes, but frankly I don't think it's fit of the mold takes away from the impact of seeing just how much of a train wreck mainstream nutrition has become. Jamie's Food Revolution is set in Huntington, West Virginia - apparently the unhealthiest city in America where nearly 50% of the residents are not just medically definable as overweight, but rather as obese. Nicely adding to the drama, folks in Huntington don't really know who Jamie is and what he's about and he's not welcomed with open arms. The first two episodes revolve around Jamie taking on an elementary school where the students can't name common vegetables and where the cooks serve up both refined food and attitude, as well as around Jamie's work with a family where everyone's morbidly obese and cooking involves a deep fryer which upon Jamie's urging the family ceremoniously buries. Hopefully the show will serve as a catalyst for change by exposing the problem for prime time America to see. As Jamie notes at the end of the second episode, the nuclear weapon of change are parents and if he can trigger some concern, maybe, just maybe, the timing's right to tackle the issue. Between Michelle Obama's championing of childhood obesity, the fires stoked by a decade of fear mongering around obesity along with the passage of a bill that will see some modicum of societal health responsibility in the US maybe the ground really is remotely ripe to till. The show's got flaws. It's at times overly saccharine. It seems disjointed with flashbacks to scenes that were never aired and it doesn't seem to follow an entirely linear story line, but it is most certainly worth watching. 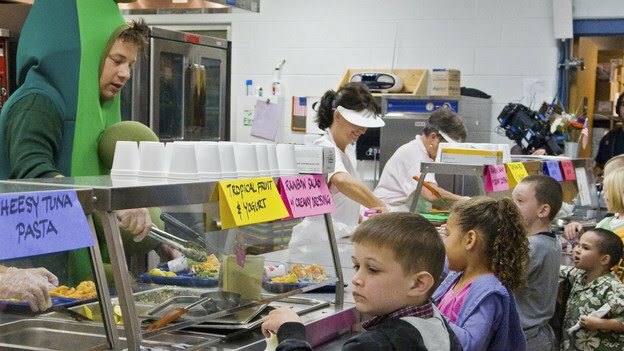 If you're a parent of a child going to school in North America where they're buying or being provided food in school take some time this Friday night to watch Jamie Oliver's Food Revolution or easier still, do what I did and watch the episodes online on CTV.